chals: Here comes the sun. I know it took a while until I could place the solar panels in the right location but I've been busy all summer long. 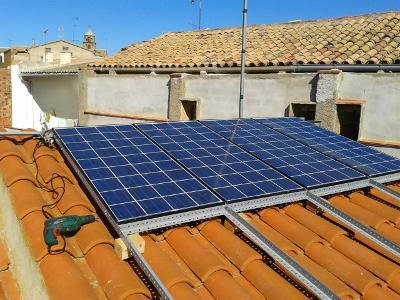 I bought four solar panels at the end of July and they arrived at the beginning of August. First, I made a provisional installation to see if they worked correctly and they did, but they could not take advantage of direct sunlight all day long. 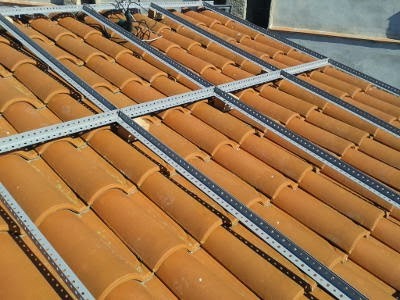 I started building the frame to hold eight big solar panels and I did all the work to put it on the roof of the house. 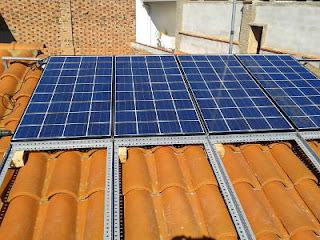 Today I have finally "uploaded" the four initial solar panels and connected the cables. They have been producing good electricity all the afternoon. "Good" as in both "environmental friendly" and " for free", or "gratis". If the results are good, I'm gonna get four more for Christmas. They are really cheap now so it is the right time to do it.